On Tuesday 5th February, Sannah Nazim from Carlton Bolling competed in the Regional Young Chef Competition at Betty’s Cookery School, Harrogate. This competition was organised and promoted by Rotary International in Great Britain & Ireland, and supported by Betty’s. 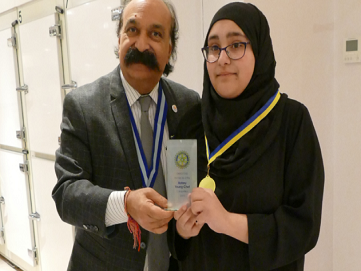 All costs for the event were covered by the Rotary Club of Bradford, in support of Miss Carpenter’s Carlton Bolling Interact Club. The judges were very impressed with Sannah’s confidence and initiative, and commended Carlton Bolling for helping her to prepare. Sannah was awarded a runner-up trophy for her meal consisting of sunshine chicken skewers, fish curry, and rosewater meringues for dessert. She will be carrying on to represent Bradford in the next round of the competition in Leicester at the end of March.